I mean, it's only been a day. But on that note, do you have any feedback? I'd greatly appreciate it. How do the scripts look? Is that issue resolved? Is the note still forced, or does it need to be more pronounced now? I'm out of town so I can't promise as quick of updates as usual, but I'll try to keep this alive for the time being. Your second note is the best one. It's simple, yet conveys the meaning that they're a team with a musical theme. And that's all we need. The uniforms are great for the team. However, they remind me of the Angels' 1997-2001 unis. But, the Angels never existed. Quirky uniforms work well with this color scheme. Really like the re-worked "N" logo. I also think it would be really cool to incorporate the music note as the beginning of the N (like in mbannon92's sketch). Rock on dude, you're doing a great job with these. Nope, not dead. It'll slow down, as the next team is the last that I'll have done ahead of time, and there's a few past that where I'm short on ideas. I guess I forgot to mention that I'm on vacation and haven't been able to update since last Friday, but I'll finalize Nashville next week. The Chicago Wind Sox are another of the USBL’s premier franchises, outliving the league itself. The Wind Stockings were the second team to take on an official nickname behind the Flying Shearmen, and chose the name by combining a reference to Chicago’s nickname, the Windy City, and following the trend set by earlier clubs by naming them after the color of a team’s stockings. Royce Flagg, the owner and founder of the Wind Sox, patented his windsock in the early 1900s, and it’s no secret that his invention and the team name are linked. The team was an instant powerhouse in the USBL, as they won 6 titles in their first 20 seasons of play. Much of this was led by the late Daryl Maldonado, one of the all time greats at catcher, both behind the plate and in the box. Maldonado was one of the game’s icons and is considered to be a top five player in the history of the game. Recently, the Wind Sox have sputtered, with no postseason appearances since 2009. In that span, the team only finished with a winning record once--in 2013, where they were a game over .500. They haven’t climbed higher than 6th place in the American Division, and fans are tired with all the mediocrity. Burk Tolle is a German-born leader in the city of Chicago, as he’s won the batting title three years in a row, hitting well above .330 in all of those seasons. He plays with his hair on fire, making aggressive plays both at short and on the basepath. In the minors, he was suspended 20 games for his involvement in a brawl, but he’s been able to put his emotions onto the field. Tolle is a ridiculous contact hitter, with only 16 strikeouts in 645 AB’s in 2014, which is certainly a trait the Wind Sox like out of their leadoff man. Chuck Miller is another consistent piece in Chicago and is the definition of durable. He has started every game since early 2013, and has put up 35 home runs in both seasons. If the Wind Sox want to turn things around from the first half, additional support will be needed for Tolle and Miller offensively. The Wind Sox made a deal with Nashville 8 days ago for Luis Echevarria, who’s considered an unlikely #1 pitcher. Coming out high school, he was scouted to be a potential closer for the Blues, and wound up as a set up man and middle reliever due to his stuff--he only throws two pitches. He made a spot start in 2013 and wound up throwing a 2 hit shutout, and has assumed ace status this season. 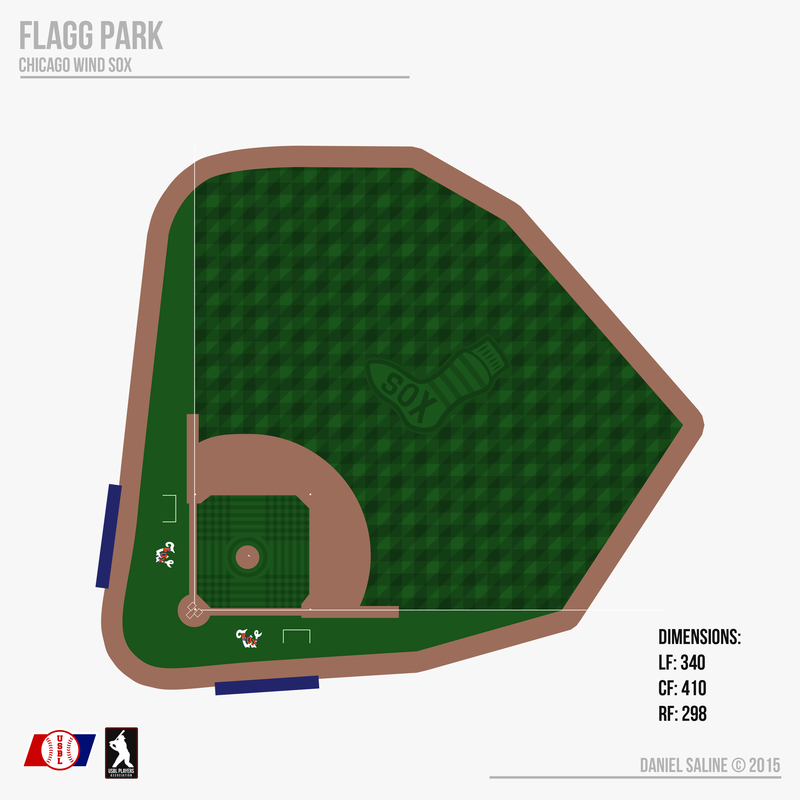 Flagg Park is another arguably the most recognizable stadiums in the league, and the team always manages to fill seats, even on down years. The ballpark has had three separate streaks of more than 200 consecutive sellouts, including a sport-record 283. The park was built in 1918 and was named after Royce Flagg when he retired as owner and handed the team over to his son Rick in 1974. Flagg Park has the shortest right field in all of baseball--the official distance is 298 down the line, but a 44-foot high metal wall balances things out fairly well. The wall fits both a manual scoreboard as well as the out-of-town board stacked on each other. Behind the wall is a 12 story building which is connected to the stadium. It was originally a standalone, home insurance office building that was purchased by the Flagg family. The building was turned into a collection of rooftop seating, restaurants, and an iconic Chicago baseball museum. In left field sits another manual scoreboard that holds the lineups, scores, and other information. The only digital screens are the thin banners on the facade of the lower bowls. Past centerfield is Maldonado Street, a pedestrian walkway named after the player. The street wraps around the building and and is enclosed in the stadium’s property, so it isn’t open to those outside the ballpark. The street used to be for motor vehicles, but it became so dangerous to drive due to no outfield seats--the street backed right up to the outfield--that the Wind Sox were granted the rights to the street. Lastly, the crooked backstop adds to the timeless nature of Flagg Park, a quirk that was common when the stadium was constructed. Hey guys I don't know if Im posting this to the right place because I am brand new to this. I came across this around midnight last night and stayed up until 3 reading about all the teams. I am addicted. I literally made this account just to talk about this league. The one jersey suggestion that I have right now is for the Jacksonville Gators. IMO the dark green hat does not go good with the lime green alternates. I would like to see the black hat, lime green jersey, white pants, and black stirrups. Other than that everything looks perfect. Keep up the great work! Why is the away wordmark curved on the logo sheet but straight on the jersey? just a simple mistake I think because in the paragraphs above he says "the road script is supposed to be straight, the logo sheet is incorrect"
Loving what you did with Chicago! The name is perfectly weird and old-timey, and sounds like something that would've been done in the late 1800s/early 1900s. The identity is like a combination of the White Sox, Red Sox, and Tigers. I love the W-SOX combination, and the curly Old English/Western style font is really fun and quirky. It's a shame they don't put the sock logo on the home sleeve, but I'd definitely buy a t-shirt with that logo on it. I don't have any suggestions, but I do have a question. 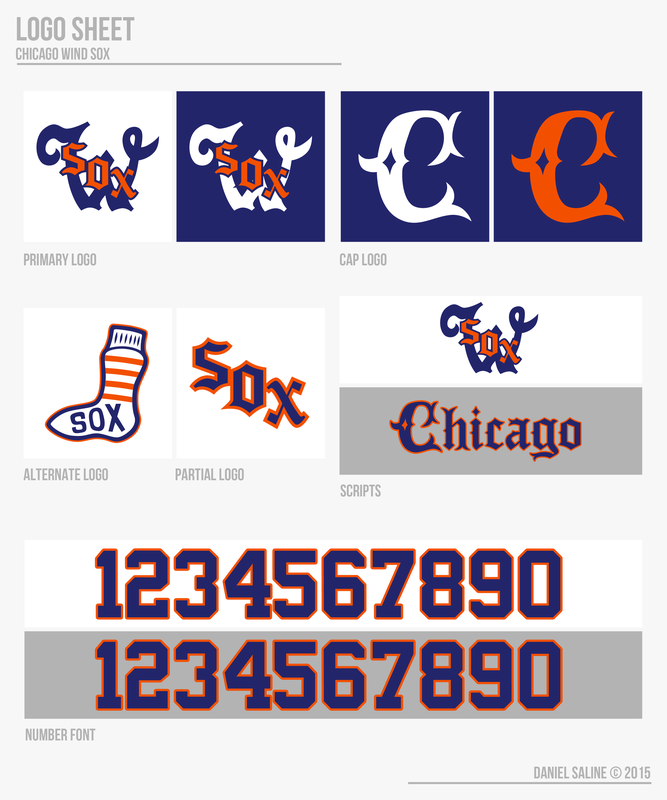 In the W-SOX logo in the header you have the outline on "SOX" matching the background, but on the logo sheet and uniforms it matches the color of the "W". Personally I prefer the outline matching the background, but either way you'll want to make it consistent. Where are the Wind Sox uniforms? I would definitely buy that home hat. Great job with these. 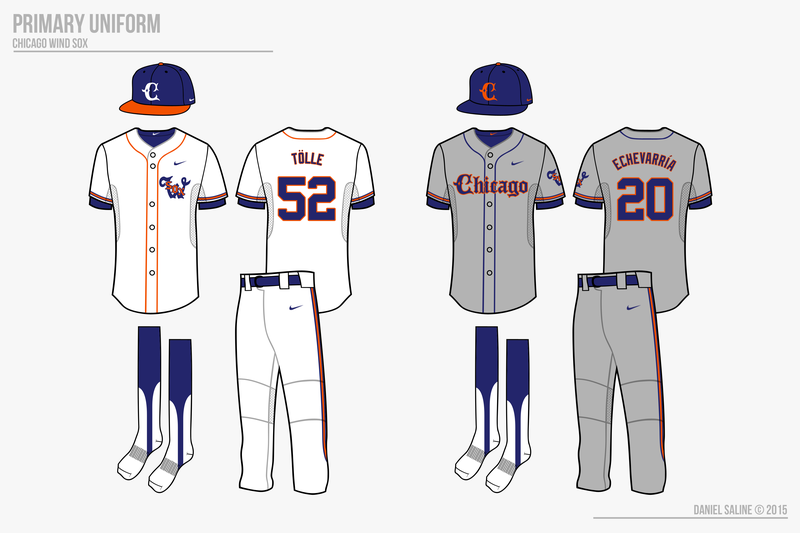 The only suggestion that I have would be to put the sock logo on the home sleeve. That's it! The team doesn't carry multiple pairs of stirrups and I don't really see them adding another color. And the hats and jerseys are mix and match, so the black-lime-white is used on occasion. That's right, the jersey is correct. I'll try to fix that soon. Shoot. I think I did this with Omaha as well. For me its a tossup so I'll come back to that. I think the white outline is a little more consistent, but the blue makes it stand out more. You're right, either way works. I would probably buy all these hats As far as the logo goes, I think it's a little too quirky to go with with the other logos. I also don't like using three different logos in such close proximity especially when one of them isn't a standard script. Not a good reason, but it'd feel disjointed to me. Hopefully the link isn't broken again, that happened when I first posted it today. Anyone else having this problem? I've gone through this entire thread and it appears that only the links to the different teams' uniforms (not their logos/wordmarks or fields) are distorted/broken. They show up fine for me. I love the Wind Sox. Classic name that is very creative. The logos and uniforms are also well executed. Only suggestion would be to put the sock logo on a sleeve of the home jersey since there is a logo on the away sleeve. Nice job! Aren't the Wind Sox the 16th team? 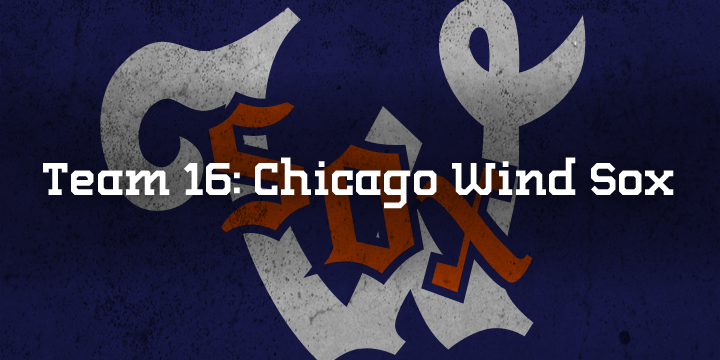 So your title should say "Chicago Wind Sox - (16/20)"? And also, I think for a more "classic team" look, I think the home jersey should have the sock logo across the front, rotated to the side. Yep, got it fixed, thanks. About the socks, that sounds like something that would have come before a set like this, similar to the Red Sox in 1905 or so. Maybe a nice throwback, but it sounds a little prehistoric for this league.